GET an up-close look at nature in two of its most pristine forms deep in an Indonesia jungle. Not even an hour into our trek through dense rainforest, we spotted one. But as quick as he appeared, he was gone, lost in the vast wet canopy once more. Eager to catch another glimpse of one of the world’s most endangered great apes, we took off in pursuit. Dripping with sweat, we scrambled along the peat moss jungle floor of Gunung Palung National Park in West Kalimantan, Borneo, in a frantic search for a wild orangutan. But the old man of the forest was wise to us and he gracefully moved on, swinging from tree to tree before stopping 60 m up to bombard us with wooden missiles. As we flopped down, exhausted, the noises of the forest were overpowered by the roar of chainsaws in neighboring forests. Illegal logging, driven by global demand, destroys vast areas of Indonesian forest each year and Bornean orangutan numbers have dwindled from hundreds of thousands to about 45,000 in the wild, according to the UN Environment Project. In addition to illegal logging, open-pit mining and palm-oil agriculture, coupled with poaching, have led to dire predictions that orangutans will be extinct in the wild within 20 years. Gunung Palung National Park is haven to about 2000 of the world’s biggest arboreal mammals-orangutans that eat, sleep and travel through the trees. It is also home to endangered species such as sun bears, proboscis monkeys and gibbons, plus hornbills among an estimated 178 types of birds. 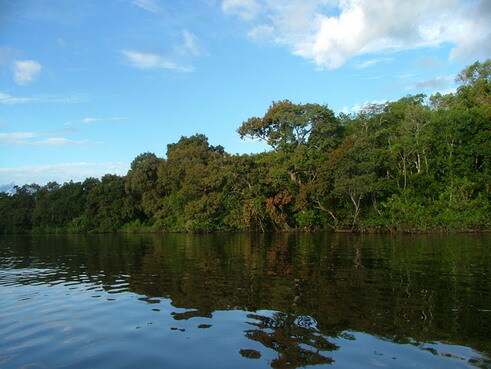 “In terms of biodiversity, Gunung Palung is one of the top places in the world. Kalimantan’s rain forests have the tallest rain forest trees in the world,” field director for Gunung Palung Orangutan Conservation program, Jamie Kemsey, said. Sadly, poorly organized tourist routes and a lack of information are hindering the orangutans’ biggest chance of survival-ecotourism. Over the past couple of years illegal logging has been greatly reduced, thanks to the commitment of park authorities and various organizations such as Gunung Palung’s Orangutan Project. Tourists are being granted access to the park, but only into the less-developed part called Lubak Baji. While some people argue that wild orangutans should be left alone, others warn the threat of logging will be diminished only when the forest makes money in other ways. Getting to Gunung Palung National Park is no easy feat and definitely suited to the adventure traveler. “In terms of simple logistics, you must visit the park service office and get a permit and a guide from that office,” Dr Kemsey said. Permits cost about $1 from the office in the main street of Sukadana. However, getting to Sukadana can involve flights, speedboats and motorcycles. While the park is spectacular, the closest town is Pontianak, which is good for little else than a place to rest your head before setting off on your eco-adventure. Garuda has flights to Pontianak for about $150 return from Jakarta. We stayed at Hotel Kini, which is about 15 minutes from the airport and offers bed and breakfast for two for about $35. From Pontianak you will need to get to the small and dusty fishing village of Ketapang. The cheapest option is a six-hour speedboat ride costing $6 each. The boat leaves daily at 6 am and can be booked from any hotel. Or you can take a 30-minutes flight with Trigana Air or Indonesia Air Transport for about $50. The last part of the trip, from Ketapang to Sukadana, involves a three-hour motorbike journey or a two-hour taxi ride. While the local bus is also an option and costs next to nothing, a taxi costs only about $10 and is far more comfortable. But if you have plenty of time on your hands and would prefer to travel like the locals, take the local boat. First, catch a taxi from Pontianak to the neighboring village of Rasau, then head for the jetty. Depending on when you arrive, there is an overnight, 15-hour boat ride that leaves for Teluk Melano. The uncomfortable and very noisy passage costs about $2. When you arrive in Teluk Melano, the only form of transport available is a motorbike for a 30 minutes ride to Sukadana. Once in Sukadana, rainforest is on your doorstep. Aside from picking up your park visa from the park service office here, you will also need to hire a guide. Our guide was a delightful but non-English speaking man called Idris. He carried most of our stuff and cooked all our meals. It is also possible to hire English-speaking guides. Guides cost $10 a day and you supply food for him and yourselves. We also had to pay to use our cameras in the park. The camp area is a good 90-minute uphill hike through humid, slippery, spectacular primary rain forest. Lubak Baji has a wooden house hidden deep in the rainforest. There are no mattresses, or sheets and pillows, so pack accordingly. Once there the solitude and scenery cannot be compared. First thing in the morning, gibbons honk loudly on their way to breakfast, across the roof of the hut. And at night we went to sleep to the eerie tunes of the forest birds. Gunung Palung National Park is one of the most important conservation areas in West Kalimantan that characterized by high biodiversity and a wide range of ecosystems with their associated floral and faunal communities. As well as for its great conservation value, the park is also an important centre for research and environmental education, a reservoir of genetic resources and a tourism attraction. Within the park, Lubuk Baji and Kubang Hill has been designated as a site that has high tourism potential due to its extremely diverse flora, fauna and beautiful scenery, including with the interesting Balinese community of Begasing village. 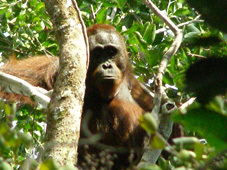 Gunung Palung National Park provides suitable habitats for Bornean orangutan (Pongo pygmaeus wurmbii), including fresh-water swamp forest, peat-swamp forest, lowland dipterocarp forest, and lower mountain forest. They spend most of their lives high in the trees where they feed, eating mainly fruits, leaves, tree-bark and insects. Male orangutan, reaching a weight of 90 kg and an arm-span of up to 2.4 m, have enlarged cheek pads and make distant calls to defend their territory. windshield repair on welcome dear travelers! dent removal options on welcome dear travelers! corporate proxy soli… on welcome dear travelers! orangutan project – harvard univ.